The first few hours in Zambia were really exciting, we became millionaires! But sadly it was from our own money taken from the cash machine, a million kwacha is around a hundred and forty pounds. We also found that we could afford to go shopping again with food being cheaper here than Malawi, though still expensive. However the minute we stopped a local kid felt the urge to want to guard the car for us. Of course we declined the offer but knew full well he would in the vain hope he would get some money, how wrong he was. 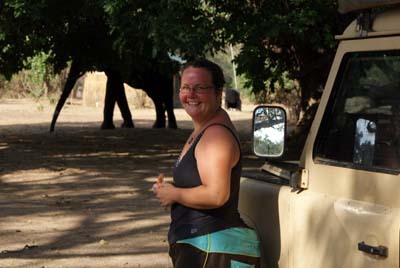 With a quick shop complete we headed off for South Luangwe National Park. The instant we left Chipata we realised how spoilt we have been in Malawi as the tarmac vanished we were left with a horrendous corrugated road that rattled and shook us about. We never thought we would get a repeat of the northern Kenyan road. 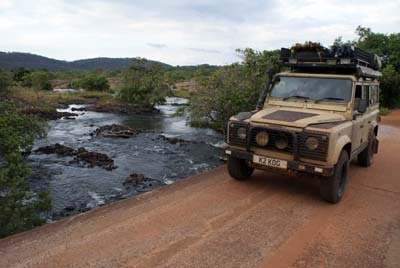 Though this time we went for African style and drove quickly across them, which made it at least bearable. After a painful journey the campsites at the end made it all worthwhile. We ended up trying out two places for variety but we were in heaven as they were both like the campsites that make you feel you are truly in Africa. It had been a long time coming but finally we were staying in open campsites, with animals roaming freely, a national park across the river, tranquil atmospheres and most importantly swimming pools! Like small children at Christmas we could hardly sleep at night due to the excitement, we went to bed early and rose as the sun started to appear in the horizon, whilst only half sleeping during the night as you are intently listening for nearby animals. 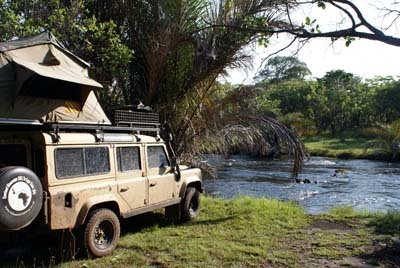 Crocs Valley Campsite was great, with Gweneveer parked right on the edge of the river, giving beautiful views and easy spotting of animals coming down to water on the opposite bank. 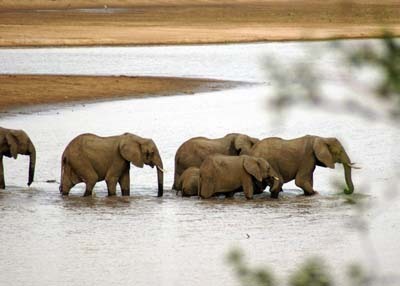 We even spotted a herd of elephants crossing the river in search of mangos, the tiny baby elephants being pushed along by their mothers as the water gets deeper. They escape the park to terrorise the villagers when the mangos are in season, this does mean at night you get echoes of gun shots as the locals try to frighten them away. They even have a hippo friendly swimming pool to make sure the hippos can escape as they often come in for a swim. 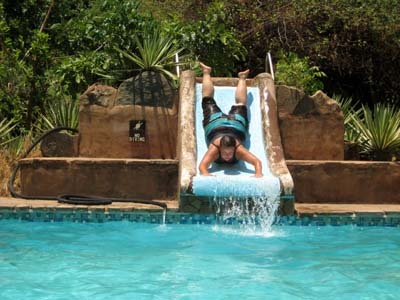 This basically meant the sides of the pool have been made to slope down. However it may be hippo friendly but not Katie friendly, if getting in was an elegance free zone, then climbing out was in another realm altogether. She seemed more at home with Sea Lions than the rest of the human race, slipping and sliding, splashing around back and forth until she eventually decided to drag herself out on her stomach! Just round the corner is Flat Dogs campsite that was highly recommended so felt the need to see for ourselves once the Dutch had caught us up. Instead of being against the river you are camped under massive trees making it very much more wood like. 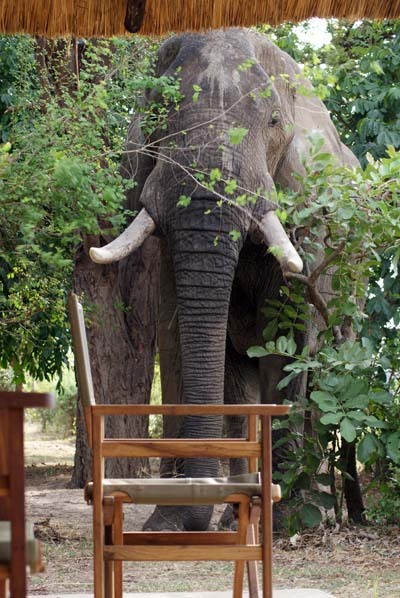 Many of the trees also have platforms high up for either camping on or simply to escape approaching elephants. Every day was magical as the camp is visited by Elephants and Hippos at all times, making you ever vigilant at what maybe behind the next tree. Of course this is wildlife and humans sharing the same close space, so sometimes it can get a little bit scary. One such moment came when returning from the pool, when we stumbled upon Gilbert, a good size male bull elephant with no tail. Grabbing our cameras we went to take some snaps, using the permanent safari tents as cover and protection. We spent some time with him, watching in amazement as the elephant was eating, curling his hairy trunk around the tree and stripping the green leaves off with one easy pull. At various times he came towards us and our hide-away, making us sneak around out of site and further away. After some time we decided that we would leave him alone and head back to the car for lunch. As we made our way back, thinking we were taking a wide enough line away from the elephant we suddenly heard a loud crashing noise as Gilbert decided to charge at us through the bushes. Adrenalin instantly surges through your body causing everything Katie knew about elephants to disappear in a flash and she took off as fast as her legs would take her. Of course this is what you shouldn’t do, so Katie was halted in her escape by Steve who by some miracle forced her to stand still. This must be the only time Steve has managed to overpower Katie, but it worked and the charge was halted about ten metres away. 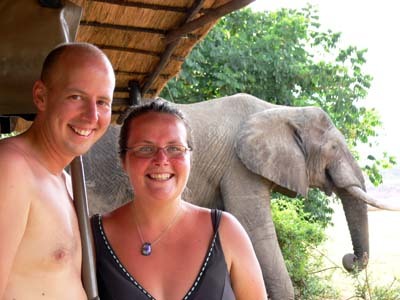 With only a small bush, which a six year old girl could have walked through, between us and the elephant, was scary and Katie was less than impressed with Steve’s idea of just standing still. We held our ground and after some heart stopping moments he turned and walked away. After a few days of being surprised at the campsite we decided to venture inside the park and were instantly in love with the place. The variety and density of animals was incredible, around each corner we found ourselves bumping into different types of animals. The highlights were certainly several large herds of twenty plus elephants, along with a single bull elephant that was marching towards us down the road. As usual we didn’t manage to see any cats, but the quantities of everything else made up for it, especially the addition of the Puku (deer to most safari folk!). 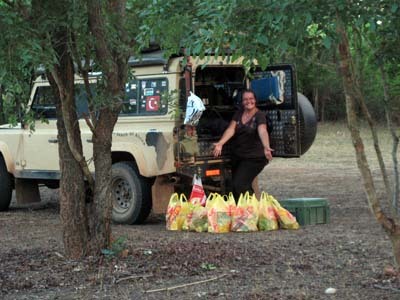 Returning to camp was not as relaxing as we thought; it is amazing how stealth like a 4 Ton Elephant can be when sneaking up on people eating pasta, getting within 10 meters of the car before we realised. Unfortunately even though we had put out some of the Hippos favourite food between the cars, we were never given the treat of getting them close, possibly a good thing after our recent incidents. Fearing the road back south we decided that we would cross the national park and exit at the northern part via a very seldom used track. No one could really give much advice on the condition of the route apart from it has a deep river crossing in it. After several days of no rain it was typical that the night before we set off the heavens emptied a ton of water on the area. Determined we all (three cars) set forth only to find the tiny track was slow going due to deep sticky mud and large puddles. Half way along the road as Steve left the car to investigate the mud, Katie took the opportunity for fun and jumped in the drivers seat. At this same point we also took the lead and therefore Steve did nothing but get in and out, whilst Katie covered the car in smelly, wet mud. Not sure what we feared as other than one little section, that we probably should have gone around instead of almost getting stuck in, the route was easy. 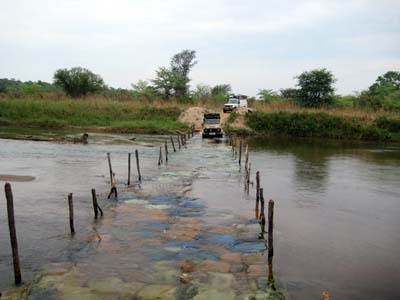 Even the river crossing with a bed of sand bags proved to be little trouble. So after several long hours through the park we turned up at the gate with a very messy car, but with two very big smiles. 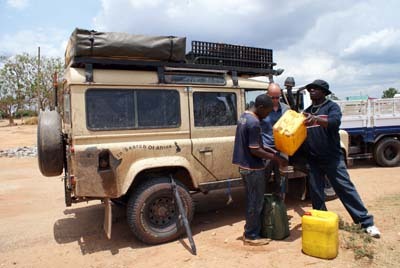 Of course some were now writhing in pain as the whole journey was spent with the navigator being armed with a book to repeatedly kill Tutsi Flies that would enter the car in their dozens through any small gap, simply to bite you to death. To our amazement Zambia is more beautiful than we had anticipated, with large varieties of trees covering every inch of the landscape. And then out of nowhere we stumbled upon an old English style estate, Shiwa Ngandu, in the middle of the nowhere. From old farm buildings to a mansion and even a church, the place just seemed surreal. As we crossed the estate with the tantalising aroma of Cedar trees filling the car we almost felt like being back home. The best part of Zambia is the emptiness of the place; it is so unlike any other African countries so far in that there is more wilderness than there are villages and people. This meant that for the first time in months we could simply go for a walk. Our stroll that turned into a hike was a 14km round trip to see a waterfall. Of course although it was lovely the title was a little misleading and it was more a cascade of water, rather than your pictured long drop of water. Still the scenery was peaceful and the atmosphere a relaxing place to while away some time. 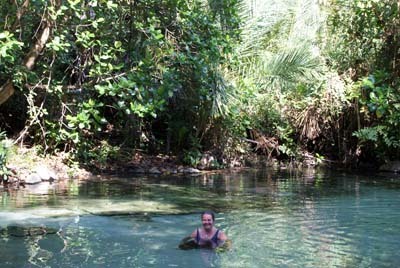 Our reward for some morning exertion was an afternoon of relaxing and soothing our muscles in the Kapishya Hot Springs, a small pool of incredibly hot natural spring water. 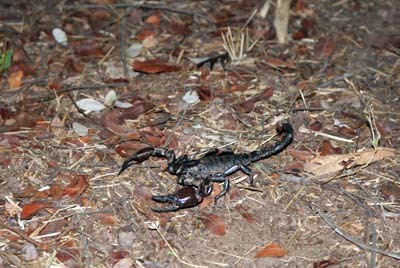 Even when you think you can travel quickly on tarmac in Africa, there is always something slowing you down. The road heading south was laughable at times when you have to slam on your brakes, charge off the road onto dirt, simply to avoid the lorry eating sized pot holes that sprawl across the road. Added to this that our time coincided with a diesel shortage meant finding fuel was a problem. Of course Africa is a resourceful place, so whenever there is a shortage, a local man reveals his private stock. With no other option we had to resort to buying some from plastic containers, whilst not really being reassured by the use of an old ladies sock as a filter. It seems that we haven’t quite got our timing right for Zambia and possibly should have been here a week earlier as most days we have had rain. It has proved a little exciting though because as with all African things, it comes in a dramatic fashion with lightning and great moody skies. 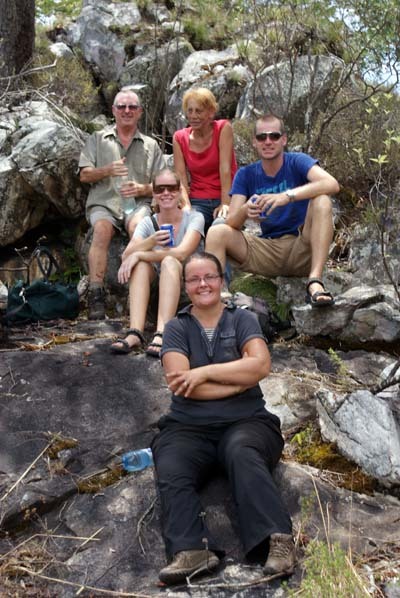 We stayed at the Mutinondo Wilderness Camp and whilst of in search of more waterfalls we were cut short. Not initially by rain but by Katie destroying her already repaired sandals. They are becoming true African shoes with more superglue parts than original. So instead we returned towards camp and took out the canoe for a spin down the river. It was so quite and calm, apart from the confusion over who was in control and who kept aiming us at low hanging tress! 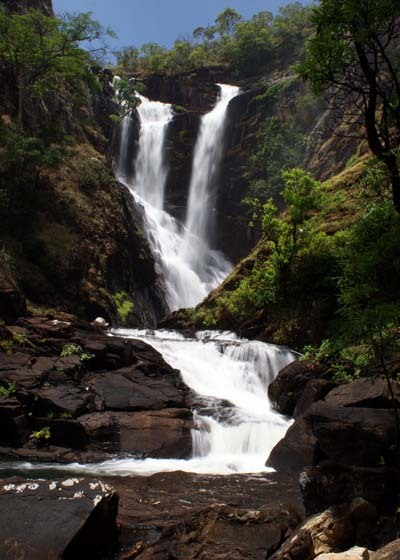 As we headed to Kasane National Park we stopped off at Kundalila Falls. It was good to finally get to an actual water fall, though the realisation soon set in that this meant a steep descent to the base of the falls. Kundalila is pretty impressive with the water plummeting about 75 metres into one pool that then cascades down over rocky terrain and splashes into another. The twisty walk down nearly caused the guide some embarrassment as Katie stripped down to her pants after finding loads of biting ants working their way up her legs. After a few minutes of slapping her legs as she walked and still finding she was being bitten the trousers came off. Reaching the base we dived into the refreshing if not freezing water, with Steve and Roy climbing the rocks and then swimming under the actual falls. That night was one of the most dramatic sun sets that we have seen on the trip. 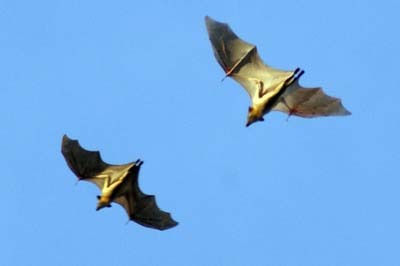 Luckily around this time of year Kasanka National Park becomes home to several million fruit bats. 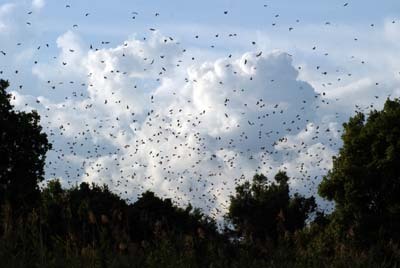 As day becomes night the roosting bats leave the safety of the trees and head out to feed during the night. 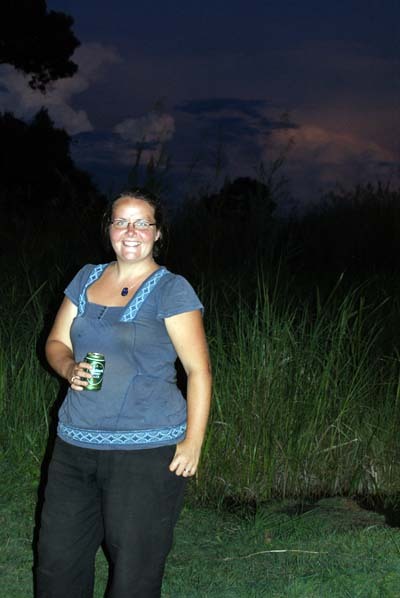 Set up in the viewing spot, with beers in hand we sat back in amazement as for thirty minutes the sky was filled with millions and millions of bats, circling the orange sky before souring over head. If we thought the ants from the water falls had been bad, nothing had prepared us for our wake up in Kasanka. As normal Katie left the tent first and within seconds of touching terra firma the screams began. Surrounding the entire area were thousands of ants of different sizes, but all with one objective to bite anything and anyone. You couldn’t even stand still for a second without them climbing on your feet and legs. 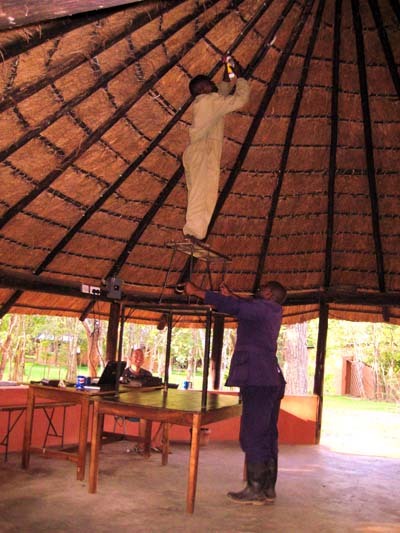 Whether it is the newly occurring rains or just Zambia, but nowhere else have we had such issues with insects and bugs, both morning and night when flying insects appear in their droves. Made worse when wearing a head torch and they miss the light and fly into your face! After the usual stocking up and this time finding Katie some new shoes we left Lusaka, the capital, to continue south towards a home. We have always been impressed and honoured by the kindness that people have shown us and none more so than Debbie and Andrew. We had meant them in Wales during a weekend off road just before they left on the same trip. Having followed their progress and kept in touch they invited us to spend a few nights. Having home comforts again was great. We made full use of the washing machine to try and remove the last eight months of dirt and grime that Africans roads had left. This it self was a treat for Katie as she got a brake from having to hand wash Steve’s pants. Just being able to relax on a sofa, see some trashy TV and have some wonderful home cooking was a perfect way to unwind. 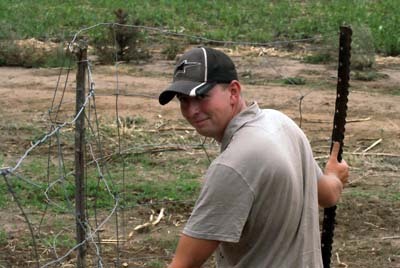 However the time was not just sitting around, we even had a personal tour of a Game Farm that Debbie’s Uncle owns. This was certainly the highlight, especially as we got to add a few new species to our spotted list. Spending time with locals also gives a greater insight to the African way of life. Our favourite story was about a night security guard who kept falling asleep at his post. The owner would go out and come back late at night to find him asleep, so he would fill a bucket and throw it over the guy, waking him in shock. After explaining that he is paid to stay awake he left him in hope of improvement. A few weeks later he returned again to the sleeping guard, so more water and more explaining. The third time he returned he again found the guard asleep, but this time the guard knew that he couldn’t stay awake and had prepared for the inevitable. The owner simply fell into laughter at the sight of the guard dressed in waterproof trousers, rain jacket and an umbrella! We finally managed to pull ourselves away from modern day comforts and get back on the road again and head down to Livingston. We have been lucky enough to see Victoria Falls six years ago after the rainy season when the water is at its most powerful. Mist floating in the air 100 meters above the top of the falls and getting soaking wet when visiting the falls. Sadly with a new hydro dam the low water period is even longer now. 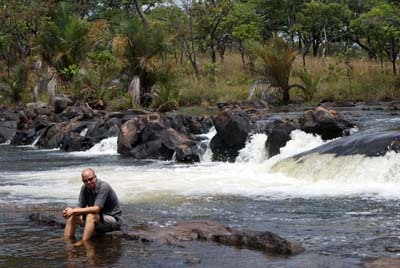 This meant at the time of our visit that only a couple of little streams of water manage to find their way over the Zambian side as it is slightly higher than the Zimbabwe side. Having seen some pictures from others we decided that instead of visiting the falls again, we went curio shopping. Actually this happened twice but it led to some great haggling fun, something Steve loves, along with a pleased Katie as she now has more than a boxful of treats. For more photos please see the Gallery.